(1) Oath of office date not found in journal. Absent excused throughout session. House Journal. World War II service, Lieutenant, "Legislature Faces Problem of Absences: Men in Armed Forces Can't Get Leave to Attend Sessions," 1/1/1943. Dallas Morning News. Pictured in uniform in 48th House composite photo. State Preservation Board. United States Army. "Shortly after winning a second term in office in 1942, Matthews left the Legislature to volunteer for military service, even though he was exempt as a state elected official. 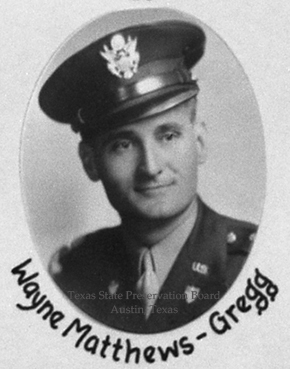 Serving in the Army from 1942 to 1946, he taught at the Adjutant General's School in Maryland and at Fort Oglethorpe, Georgia. After World War II, he continued his teaching career at Tyler Junior College." Texas State Cemetery. Matthews, Dudley Wayne. Texas State Cemetery.